The Apple iPhone, iPad and iPad Mini which are compatible to run the iOS 7, can now be updated to the latest iOS 7 version, i.e. iOS 7.0.3 which was sent today with a lot of changes, bug fixes and improvements from the previous versions where the users were facing a lot of issues and Apple did take some time to release this update, but it is not a very minor one. 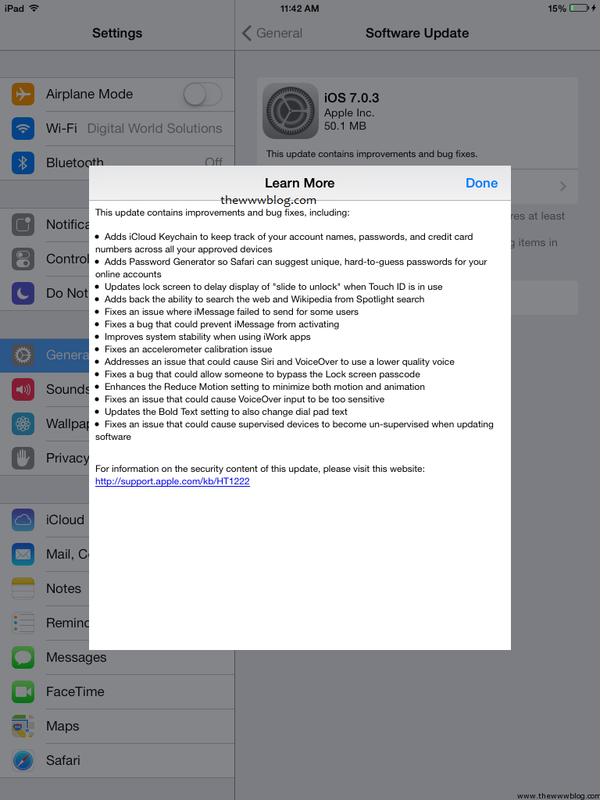 If you are already running one of the iOS 7 versions on your device, the update should be available directly in the software update section in the device. If not, check the links below to download the IPSW files directly and update through Apple iTunes. The iOS 7.0.3 brought quite a lot of changes, and we have explained that below in the Change Log, showing what all the users with the new OS version can get. The following download links are for the direct IPSW files which you can download and force update through Apple iTunes. The iOS 7.0.3 update is applicable to the new iPad Air, iPad 4, iPad 3 and iPad 2, and in these both the Wi-Fi and Wi-Fi+Cellular models. The iOS 7.0.3 update is applicable to the iPad Mini and also the new iPad Mini 2 model which was launched yesterday.